Ms Léonie Ebert, Bachelor of Science graduate, founder and board member of the Graham F. Smith Peace Foundation, and 2017 Distinguished Alumni Award recipient is this month’s Alumni in Focus. Léonie was presented the Distinguished Alumni Award for her dedication to education, advocacy for women and Aboriginal education, and support of social justice. Founded in memory of Léonie’s husband, the Graham F. Smith Peace Foundation’s mission is to work for peace through the arts. The Foundation raises funds for artists to work on projects relating to human rights, environmental sustainability, and social justice. She founded the Graham F. Smith Peace Foundation in memory of her husband with a mission to work for peace through the arts. The Foundation raises funds for artists to work on projects relating to human rights, environmental sustainability, and social justice. Bridge, theatre and visual arts (concerts, exhibitions etc.) and reading (hard copy and online). Favourite place to eat when in Adelaide? There are many excellent places to choose from but I regularly meet family, friends and business acquaintances at Luigi Delicatessen on Flinders Street. I would become involved in social and political activities. My home, but more in the way Indigenous people care for country. Womble our poodle and the generous actions of people who bring about change for the better. Something for which you are grateful? My father’s foresightedness in migrating to Australia when Ceylon (Sri Lanka 1972) gained independence in 1948; he predicted that there would be disruptions between Singhalese and Tamils. If you could pursue a different career, what would it be? When I began at Uni, I enrolled in a Science degree because the University of Adelaide did not offer a degree for veterinary physicians at the time. My ambition was to be a veterinary physician. Fortunately, circumstances took me into education. I would not want to pursue a different career, but if I was pushed to make a choice, I would be a human rights and/or environmental lawyer. It is great that students can study for two degrees now. Firstly, that you need to work on developing, maintaining and initiating relationships with family, friends and the community at large; this does not just happen. I learned this from my husband Graham Smith, my mother and personal experiences. Secondly, to have the wisdom to know what you can change and to put your energy into making small and gradual changes to achieve the positive outcome you desire. Four words your closest friends would use to describe you? Success is knowing that what you are doing is helping others to create a better world that empowers people and communities. Two things: first, that as a woman I should always be economically independent and second, the importance of building and participating in community. Your career path in two sentences or less? As an educator and founder of the Graham F. Smith Peace Foundation, I have had a challenging and fulfilling life. I have been able to effect change for a better world in education and peace and am privileged to have worked with many wonderful, like-minded people, young and old, to achieve our vision of a better world. There are many highlights including gaining a scholarship to study a Masters in Educational Administration; organising the magical Women’s Conference in Cook Islands for the Teacher’s International Organisation; being the founding chair of the Status of Women’s Committee in the 70s; the first woman president of the Teacher’s Union and the first woman president of the Australian Curriculum Association; the Kaurna Reconciliation Sculptures and education walking trail, but the establishment of the Graham F. Smith Peace Foundation is number one. Endeavour to find financial means to ensure the continuation of the Graham F. Smith Peace Foundation. In many ways: reading, watching TV, going to the theatre or art gallery, catching up with friends, playing with Womble our poodle or sitting quietly in contemplation. Listen to the radio as I prepare dinner. Is establishing the Graham F. Peace Foundation and, in its 30th year, it is still a risk. That I stand up for what I believe in and often I speak out boldly. Little do people know that depending on the situation, I am quaking on the inside. “Whatever you can do, or dream you can, begin it. Boldness has genius, power and magic in it.” – Goethe. 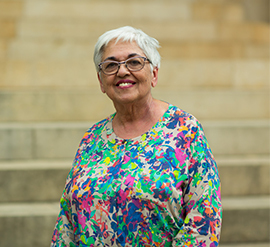 This entry was posted in Alumni eNews, Alumni Profiles and tagged alumni, alumni in focus, distinguished alumni award, University of Adelaide. Bookmark the permalink.